Ever Had the World’s Best Anything? If you’ve seen the film Elf, great. If you’ve not, keep reading anyway. How are candy corns one of the four main food groups (alongside candy, candy canes, and syrup)? The season is wrong (Halloween), they’re awful, and they’re no good. Have I ever had the World’s Best Anything? 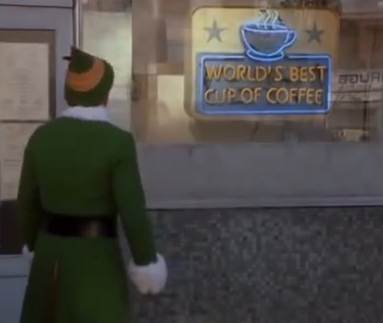 For the latter, there’s a scene when Buddy the Elf runs by a New York coffeeshop proclaiming to have the ‘World’s Best Cup of Coffee.” I won’t spoil the movie’s most crucial twist, but suffice it to say: it’s not the World’s Best. Not even close. Then again, how would I know? The closest I might have gotten would be a rack of lamb back in Iceland at Kaffi Duus. Or (heh) coffee from Camano Island Coffee Roasters. Or bulgogi that my foreign exchange Korean roommate once whipped up. All great things, sure. But I don’t suppose I’ve had the World’s Best anything, and I’d venture to say you haven’t either. Next ›This Squash-Themed Spice Latte is Better than Pumpkin — and Starbucks HATES It!